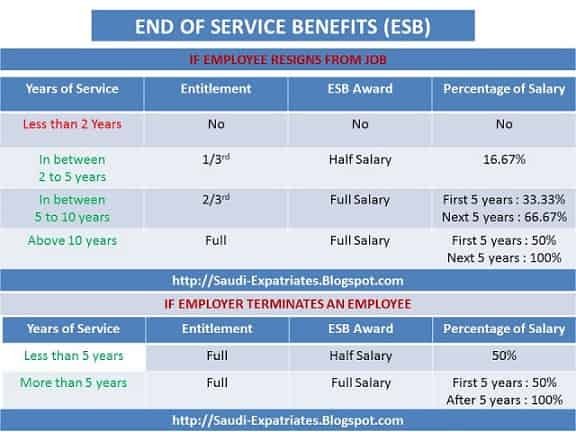 End of Service Benefits or Award is applicable for those expatriates who completed a minimum of two years service in any company of Saudi Arabia. If an employee service is less than two years in a company, Then he is not eligible for any kind of End of Service Award or Benefits. Refer Article 84 to Article 88 in English translated Saudi Labor Law . End of Service Benefits will be calculated only while you are leaving the company, Whether you are resigning the job or you are terminated by your employer, Note entitlement or benefits is different in both the cases. 1. If an employee is resigned before the service of two years, Then he is not eligible for any kind of End of Service Benefits like ESB, % of Salary, Entitlement. 2. If an employee is resigned after servicing two years but lessthan five years (2-5 years) then he is eligible for 1/3rd of End of Service Benefits award. Here % of salary will be half of the salary. 3. If an employee is resigned after servicing five years but lessthan ten years (5-10 years) then he is eligible for 2/3rd of ESB award, Here percentage of salary will be full salary of the employee. 4. If an employee is resigned from the job or the employer terminate him after 10 years of servicing (10+ years) the he is eligible for full End of Service Benefits award, Here percentage of salary will be his full salary. 1. If an employer terminates an employee from company before his 5 years of service, then he is eligible for half salary. 2. If an employer terminates an employee from company after servicing of 5 years, then he is eligible for half salary for first five years, After 5 years full salary will be calculated. - If a women employee resign the job within 6 months of her marriage the she is eligible to get full rewards of End of Service Benefits. - In the same way, If a women resign the job after 3 months of giving a birth to child, then also she is eligible to get full rewards of ESB. Saudi Expatriates can also calculate their End of Service Benefits from government website of Labor Education.